I was looking around for a quick vegan curry because I have discovered that cream sauces aren't agreeing with me right now (something that makes me incredibly sad every day) and I wanted a curry that was made to not have meat or dairy in it so I did not have to figure out weird substitutes. 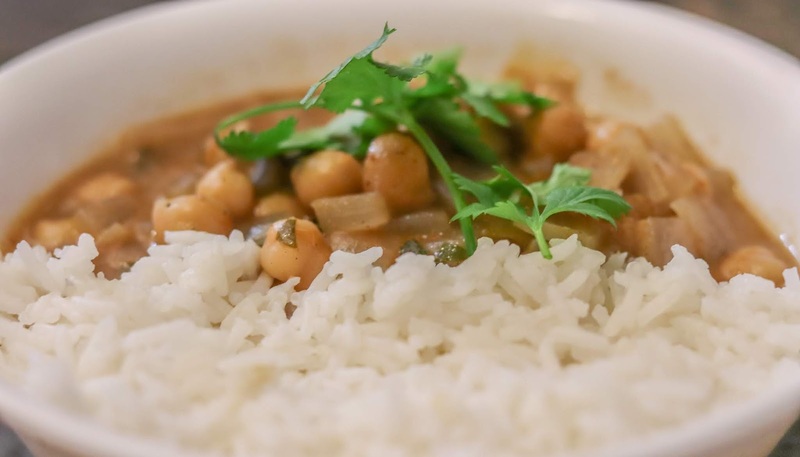 I came across a recipe for a chickpea curry that made some odd choices so I took the chance to refine it and came up with this tasty concoction. Finely dice the garlic and the onion and roughly chop the tomatoes. Heat the oil over medium heat until shimmering. Add the garlic and saute until lightly browned, stirring frequently, about 2 minutes. Add the onion and the salt and saute, stirring frequently, until translucent before adding the tomatoes and cooking until the tomatoes start to break apart. Sprinkle in all the spices and fry them, stirring constantly, until they are super fragrant. Reduce the heat to low and pour in the coconut milk, bring to a simmer and cook, stirring occasionally, until thick and creamy. Add the chopped cilantro and serve, preferably over basmati rice.